Seemingly from out of nowhere comes the next game in the acclaimed Bioshock series- Bioshock Infinite. The newest 'shock takes place not in the familiar confines of Rapture but in the all new floating city of Columbia! I'm not sure if leaving Rapture is sitting all that well with me yet. I enjoyed the first game immensely and I liked the followup almost as much- leaving all that rich back story and history... I don't know yet. Of course the good part here is that series creator Ken Levine and Irrational games (formerly 2k Boston) are running the show again. For those who don't know, the second entry in the series was helmed by 2k Marin, who did a great job telling the story of one of the first Big Daddy's in the sort-of-prequel-sequel. But Levine does make an excellent point- Firefights at 30,000 feet? Yeah that sounds good. 2K Games announced today that BioShock® Infinite, a first-person shooter, is currently in development at Irrational Games, the studio behind the original BioShock® which has sold over 4 million units worldwide. 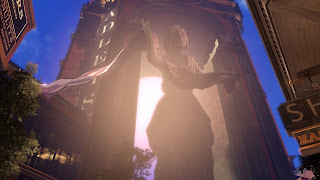 Set in 1912, BioShock Infinite introduces an entirely new narrative experience that lifts players out of the familiar confines of Rapture and rockets them to Columbia, an immense city in the sky. BioShock Infinite is currently planned for release during calendar 2012. Originally conceived as a floating symbol of American ideals at a time when the United States was emerging as a world power, Columbia is dispatched to distant shores with great fanfare by a captivated public. What begins as a brand new endeavor of hope turns drastically wrong as the city soon disappears into the clouds to whereabouts unknown. The player assumes the role of former Pinkerton agent Booker DeWitt, sent to the lost city to rescue Elizabeth, a young woman imprisoned there since childhood. He develops a relationship with Elizabeth, augmenting his abilities with hers so the pair may escape from a city that is literally falling from the sky. DeWitt must learn to fight foes in high-speed Sky-Line battles, engage in combat both indoors and amongst the clouds, and harness the power of dozens of new weapons and abilities. With the original BioShock, Irrational Games won “Game of the Year” awards from Game Informer, IGN, G4’s X-Play, and BAFTA and redefined what players expect from a first-person shooter. “But when it came to begin work on BioShock Infinite," said Ken Levine, creative director of Irrational Games, "we only had one rule: No sacred cows. This game is both true to what people love about the series and unafraid to question every assumption." 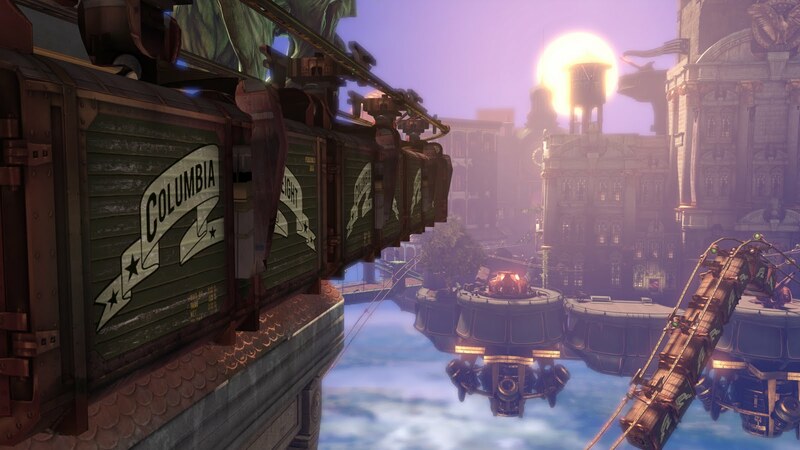 Levine continued, "In order to explore the floating city of Columbia, we needed an entirely new engine. To bring Elizabeth to life, we had to build brand-new animation and AI systems. To create wide-ranging indoor and outdoor firefights at 30,000 feet, we had to rethink, rebuild and expand the BioShock arsenal. The only thing gamers can be certain of is this: the rules of the BioShock universe are about to change." BioShock Infinite is in development for the Xbox 360® video game and entertainment system from Microsoft, PlayStation®3 computer entertainment system and Games for Windows®, and is not yet rated by the ESRB. For more information on BioShock Infinite please visit www.bioshockinfinite.com.